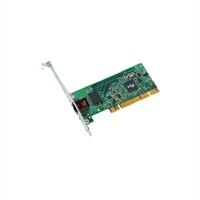 PRO/1000 GT Desktop Single Pack AdapterMaximize system performance and increase end-user productivity for mainstream PCs with PRO/1000 GT Desktop Adapter from Intel®. It features SingleDriver™ technology that simplifies installation and maintenance. Its high-performing, auto-negotiating 10/100/1000 connection automatically detects and runs at the higher speeds when it is available, allowing easy migration to faster networks, without requiring reconfiguration by IT staff. It also features Interrupt Moderation which significantly reduces CPU utilization and increases overall throughput. In addition, the Advanced Cable Diagnostics feature dynamically tests and reports network problems such as, interrupts, error rate, cable length, and automatically compensates for cable issues such as crossover cable, wrong pin-out and polarity. With features such as lower power consumption, remote wake and remote booting, the environmentally friendly Intel® PRO/1000 GT Desktop Adapter's Gigabit bandwidth makes quick work of network applications with power to spare. Maximize system performance and increase end-user productivity for mainstream PCs with PRO/1000 GT Desktop Adapter from Intel®. It features SingleDriver™ technology that simplifies installation and maintenance. Its high-performing, auto-negotiating 10/100/1000 connection automatically detects and runs at the higher speeds when it is available, allowing easy migration to faster networks, without requiring reconfiguration by IT staff. It also features Interrupt Moderation which significantly reduces CPU utilization and increases overall throughput. In addition, the Advanced Cable Diagnostics feature dynamically tests and reports network problems such as, interrupts, error rate, cable length, and automatically compensates for cable issues such as crossover cable, wrong pin-out and polarity. With features such as lower power consumption, remote wake and remote booting, the environmentally friendly Intel® PRO/1000 GT Desktop Adapter's Gigabit bandwidth makes quick work of network applications with power to spare.